There are many things that can only be said without words. Yes, without words. This year we launched a visual literacy campaign at the guild. We began with observational exercises. I call this close looking. 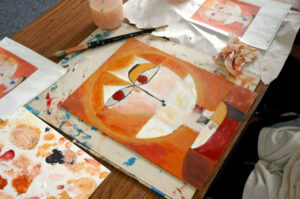 The goal is to discover and decode the phonics of visual art—line, texture, value, shape, color. We began with Paul Klee. Paul Klee wanted his make-believe faces to be truer than true ones. He wanted to portray complex emotions in his simple paintings, not just what the eye is able to see on the outside. 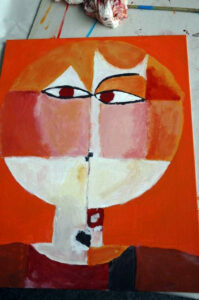 Head of a Man, Going Senile or Senecio, is a perfect painting to learn just how he accomplished this task. Spend some time exploring Klee’s original. What is the personality of the lives in the painting? What geometric shapes do you see? Is the composition symmetrical or asymmetrical? Is the texture smooth or rough? Are the values bright or dull? Is the color warm or cool? Is the portraiture realistic or abstract? This particular work was painted in 1922 while Paul Klee was teaching at the Bauhaus in Welmar. The painting now resides in the Kunstmuseum Basel in Switzerland. Klee is famous for his experiments with bold color. In this painting, notice how the variations of color in the face contrast with each other and how the combined facial colors contrast with the bright orange background. Look closely, notice how the hot red eyes seem to jump off the canvas. The simple, flat construction of the shapes is child-like—quintessential Klee. Klee used simple geometry to communicate complex mood and this is what makes his art unique. The colors in this painting are warm and the shapes are simple. But this doesn’t mean the composition is simple. Quite the contrary, the warm colors are complex, the simple shapes are constructed in a simply complex manner. And the best way to discover this complexity is to slow down, read the painting closely, and make a copy. 1. Begin by mixing little tubs of paints that match the canvas, set aside. 2. Sketch Head of a Man onto the canvas lightly with pencil, paying careful attention to think proportionally. 3. Block in the colors using the paint in a thin manner with a bit more water. 4. Layer paint using a dry brush technique until the desired effect is achieved. A close study of an abstract work of art takes time, cultivates patience and a host of wonderful character traits in the apprentice. But the most important benefit of a close reading of a painting such as this is the discovery that each line, each stroke of color, each simply constructed shape is certain phonics with vast potential to speak. This entry was posted in Art History, Visual Art and tagged art history, observation, painting on January 19, 2014 by WHWPAdmin.